Sykes Enterprises Incorporated (SYKES) is a digital marketing and customer service global outsourcer, providing customer-engagement services to Global 2000 companies. With global headquarters in Tampa, Florida, SYKES’ sophisticated solutions satisfy the needs of major companies around the world, primarily in the communications, financial services, technology and healthcare industries. Leadership at SYKES understands the swift pace of change. That, coupled with the critical need for adoption of several major, global-scale projects, brought about the company formally sponsoring an enterprise change management journey. “I first encountered Prosci more than 15 years ago, so when we started looking for a partner in change management, I was pleased to see that Prosci was still the leader. 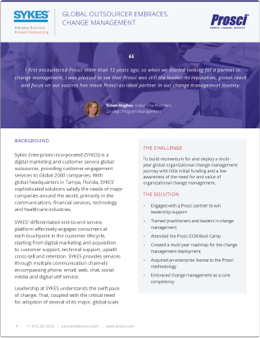 Its reputation, global reach and focus on our success has made Prosci an ideal partner in our change management journey." To build momentum for and deploy a multi-year global organizational change management journey with little initial funding and a low awareness of the need for and value of organizational change management. In the Fall of 2015, the small change management team attended the Prosci Enterprise Change Management Boot Camp, assessed the organization’s change management maturity level and created the multi-year roadmap to guide the change management deployment. With the strong initial wins and global interest in change management growing, leadership invested in an enterprise license to the full Prosci methodology, enabling cost-effective change management training and application in every region. Within a few months, SYKES offered change management practitioner trainings in Europe and Asia in addition to several more in the US and Latin America. In mid-2016, SYKES well-surpassed breakeven on the cost of a Prosci license as measured by cost of paying an external consultant, and by the end of 2016, SYKES surpassed breakeven on the cost of a Prosci license as measured by paying for materials for each attendee in addition to the consultant. Discover how SYKES leveraged Prosci partners, engaged sponsors and regional leaders, and trained practitioners around the globe - and discover more results - when you download the full story as a PDF. Client Success Story: SYKES Enterprises, Inc. Leadership at SYKES understands the swift pace of change. That, coupled with the critical need for adoption of several of its major, global-scale projects, brought about the company formally sponsoring an enterprise change management journey.